Happy Hoppy Day Series | ft. Lawn Fawn "Eggstra Special Easter"
Today I learned something very, very important. Today, I learned that in order to make a video to go along with the card, it's really imperative that you hit the record button. Sooo there's no video for this one because I didn't hit the record button. Whoops! To begin, I cut a piece of cardstock with the large banner from Lawn Fawn's "Stitched Banners" die set. I also cut a piece of green plaid paper from their "Perfectly Plaid Rainbow" paper pack with the same die. I then used the "Grassy Border" die to cut the green banner down in two layers to get the base for my scene. I used some Broken China and Salty Ocean Distress Oxide Ink to create the sky. I used the Distress Sprayer to splatter some clean water and patted it dry with a piece of paper towel. I stamped the images from "Eggstra Special Easter" with Memento Tuxedo Black ink on 110lb Copic-friendly paper and used the Brother 2 Scan N Cut to cut them out. I coloured all the images with Copic markers. I put together my scene and adhered the banner to a piece of colourful paper from the same paper pack and mounted that to the front of a standard A2 sized card base. To finish off the card I used some Glossy Accents on the bow and some Nuvo Crystal Drops in Dandelion Yellow to create some accent dots. Finally got the voice over for this video working, I do apologize for the delay. I hope when you watch you'll find it was worth the wait. To begin, I stamped the large flower from Stampin' Up "Birthday Blooms" with Memento Tuxedo Black ink on 110lb Copic friendly cardstock. I then coloured it with Copic markers and fussy cut it out. The image is actually much larger, but I didn't want all that stuff. The greeting is from Stampin' Up "Rose Wonder" set, also stamped with Memento Tuxedo Black ink. I prepped a piece of 65lb black cardstock from Recollections with my powder tool and stamped the flourish images from Inkadinkado with VersaMark Ink, then heat embossed with clear embossing powder. I adhered that panel to the front of a standard A2 sized card base, then added my greeting strip. It was a little harsh, so I used my black gelly roll pen to add some stitching detail. I popped the flower up on foam tape and placed that on top. To finish off the card I used some clear Wink of Stella over the petals, glossy accents over the centre bits of the flower and some Black Nuvo Crystal drops to add some accents on the background. Watercolour Wishes | ft. Clearly Besotted "Merci Beaucoup"
I know that many of us started making cards as a way of expression. We don't always have the words, whether the right ones or enough of them to convey what we feel, and while we could easily pick up another form of art; painting or drawing, we're drawn to cards because of the emotion an image can send. They say a picture is worth a thousand words and maybe that's true. A handmade card is like that. We channel our emotions into colouring or painting, stamping or paper piecing and the recipient knows the time and effort that was put in. They know the love and thought behind the little card they hold in their hands when they open the envelope. For some people, a card is a card; but for others they can feel the difference between something that was lovingly (and often painstakingly) put together instead of one that was grabbed off the shelf while getting a jug of milk. To begin, I stamped the rose from Clearly Besotted "Merci Beaucoup" set with Antique Linen Distress Ink on Strathmore 140lb cold press watercolour paper using the MISTI. I used the MISTI for this because the ink is so light it takes a couple stamps to get an impression that you can see clearly while colouring. I then used a mix of my Zig Clean Color Real Brush Markers and Distress inks to watercolour the image. Once that was completely dry, I returned the panel to my MISTI and stamped the greeting from CTMH "Cursive Birthday" with CTMH Cranberry pigment ink. I then adhered the panel to a piece of coordinating cardstock cut just a bit larger, and mounted the whole lot to a standard A2 size card base. To finish off the card I added a few clear droplets from Pretty Pink Posh to look like drops of dew. These droplets have a bit more dimension to them than I would like, but the final result is always amazing. 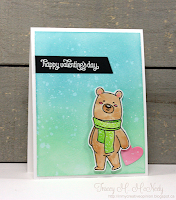 Happy Hoppy Day Series | ft. Gerda Steiner Designs and a Video! Today is the first card in my Happy Hoppy Day Series for 2018, today's card features the "Happy Hoppy" stamp set by Gerda Steiner Designs as well as a tutorial video - because I figured out more editing! YAY!! Moving forward, if there is a video with a card, it'll be at the top of the post, then I'll post the picture and do my written "how I did it" part, just like always. I truly hope you enjoy! To begin, I cut down a piece of 110lb Copic-friendly cardstock and used Distress Oxide Inks to make it look like grass. Once that was dry, I used this Happy Easter die from Memory Box to cut my front-most layer. I stamped this bunny from Gerda Steiner Designs with Memento Tuxedo Black ink on the back of the scrap that was cut away from the green base, and coloured him in with Copic markers. I wasn't sure if his tongue was sticking out or if that was his teeth, so I opted for the tongue because it was just too cute. I then fussy cut him out. I used a piece of patterned paper from Lawn Fawn's Perfectly Plaid Rainbow collection to work as my background, but when I measured it out, I found that there was much more sky than I had originally intended. To solve this, I used the medium Stitched Puffy Clouds Border die from Lawn Fawn to cut some clouds out of vellum. I adhered them down, to the sky ensuring that all the adhesive would be hidden by the green panel. I then added the green panel and finally popped my bunny up on some foam tape to give him a bit of dimension. It also helps to keep the vellum down and avoid curling. My panel was mounted to the front of a standard A2 sized card base and that is it for this card. Spotlight Stamping | Beautiful Thanks ft. Stampin' Up "Rose Wonder"
Normally I won't post using the same stamp set two days in a row, but the Rose Wonder was still out on my desk and I did say I was going to use it more often and two in a row is better than three in a month right? Maybe not, but I was so in love with how this card turned out that I had to share it right away. This card could work for Valentine's Day, but I decided to turned it into a Thank You card, though you'll never really know that because I didn't put a greeting on the outside. Just a sentiment of thanks on the inside. Either way, this card can work for any occasion. To begin, I used the MISTI and stamped the rose with Memento Tuxedo Black ink on 110lb Copic-friendly cardstock. I stamped it twice to get a good impression, something I seem to struggle with when using large stamps. I then used a rectangle die from Spellbinders to cut out the centre. I adhered the centre piece down to a piece of black cardstock, cut slightly larger and used my Copics to colour the smaller panel. I added a second piece of black cardstock to the front of a standard A2 sized card base and mounted the uncoloured frame to that. I then used some super strong two-way tape to add the smaller panel, making sure that my lines matched up. To finish off the card I used my clear Spectrum Noir glitter brush pen over the coloured petals. I made sure only to do two passes with the glitter so we don't have issues like we talked about a couple weeks back. I decided it needed just a little something more, so I added a few clear drops from Pretty Pink Posh to look like water drops on a couple of the petals. Happy Heart Day Series | Window Panel ft. Stampin' Up "Rose Wonder"
Happy Valentine's Day! Today I have the final card in this year's Happy Heart Day series. I've had this Rose Wonder set by Stampin' Up sitting in my craft room forever. Well not really forever, but for a very long time. For the life of me, I cannot fathom why I don't use it more. The rose is perfect for so many different occasions, not to mention how great it is for practicing shading and colouring in any medium imaginable. To begin, I used one of my rectangle dies from Spellbinders to cut a window out of the front of a standard A2 sized card base as well as from the piece of glitter paper that is the frame on the front. I used some post-it tape to line the glitter paper with the card base, and hold the die in place to cut them at the same time, this way the window lines up perfectly. I then trimmed down a piece of acetate to match the size of the outer edge of the frame and stamped the rose with StazOn ink with the MISTI. I had to stamp it a couple of times because my ink pad is on its way out; even then there were a few places that the impression wasn't awesome, so I used a smooth surface black pen to fill in those areas. I adhered the acetate to the back of the frame then mounted that to the front of the card base, so the entire front of the card is a window. I stamped the "Love" with CTMH Tulip ink, again using the MISTI as this is a dye ink and doesn't give the best impression the first time around. I used Memento Tuxedo Black ink for the "with". I wanted to provide a better picture of how this card would look if it were standing partially open, as cards tend to do when we display them. Super exciting news, well for me, maybe less so for you, but I hope you're excited about it. I had mentioned on my blog a little while ago that I finally found a mount for my camera and today I have the very first video. Check out the YouTube link at the bottom of the post to hop on over and see the video. I stamped the image and the greeting from The Sassy Club "Star Wars" set with Memento Tuxedo Black ink on 110lb Copic friendly cardstock. I coloured the image in with Copic markers, then masked him off and used Antique Linen Distress Ink to sponge a bit of colour around him. It didn't really pick up well in the picture, but in real life it adds just enough to the card. As I mentioned this is my first one, and I know I have a long way to go; but please be nice. I'm really trying, I promise! Today, I wanted to share a birthday card that I had created for my Grandmother. She loves florals, so I had no option but to choose Clearly Besotted. Their floral collection is like nothing I have ever seen before. The detailed designs lend a sense of realism, while still giving us all the space we need to colour using any medium we like. She also loves watercolour, so I opted to use the Zig Clean Color Real Brush Markers as my medium for today. To begin, I stamped this floral image from Clearly Besotted's "Fresh Flowers" with Antique Linen Distress Ink on Strathmore 140lb cold press watercolour paper. I chose to use Antique Linen for my stamping because I wanted to do a "no line" watercolour. Distress Inks will react with water and the lines will fade away when you apply the watercolour to an area. I suggest using the MISTI or another stamping tool because of the texture of the paper, you'll want to get a good impression. I then used my Zig Clean Color Real Brush Markers, applying the colour only where I wanted the darkest areas to be then using clean water to pull the colour out towards the edges of each petal. It's important not to work in areas that are right next to each other so they don't bleed together. Once the image was completely dry, I used my white gel pen to add highlights to the ends of the little stems (?) in the centre of each flower. My greeting, from CTMH "Cursive Birthday" set is stamped with CTMH Gypsy pigment ink. I added a scattering of coordinating sequins across the panel and adhered the watercolour piece to a slightly larger piece of purple cardstock. Then I mounted the whole lot to the front of a standard A2 sized card base. It has been an amazing level of chaos since I got this new job. I mean "mom-ing" is great, but I always loved working, I knew I missed it but I had no idea how much I missed it. I had forgotten how good it feels to get dressed up in the morning and spend the day doing something outside of the house, and then get paid for it! That being said, I seem to have lost some of my crafting mojo. I used card making as a way to feel accomplished and fulfilled, but now I need less of that so I have to find a different motivation. It's a hard feeling when you sit down with all the wonderful art supplies and stamps and paper and there's just nothing there. Perhaps now that training is over, I can get back into a regular routine with the kids at school and a couple hours to myself in the morning. To begin, I stamped bears from MFT's "Bitty Bears" stamp set. I started with the one in the middle and the two on the outside, then masked them off and stamped the second and the fourth one, all using Memento Tuxedo Black ink on 110lb Copic-friendly cardstock. I removed the masks and coloured all of the images in with Copic markers. I wanted all the bears to look different, in the end I'm most pleased with my little polar bear on the left. I remember a time when I would have left any white space blank; I think my greatest lesson in my card making journey is that nothing is white. The difference some light grays make to an area is amazing, and it makes me pause every time. After I was finished colouring the images, I used some Salty Ocean and Tumbled Glass Distress Ink to add a bit of a sky. I then trimmed down the panel a bit further and mounted that to a piece of light blue patterned paper and then adhered the whole thing to a standard A2 sized card base. I'm actually really excited to recreate this card in other colours. It's a fantastic example of how a colour palette can change how this card looks. Make it in pinks with a "Happy Valentine's Day" at the bottom and you have the cutest card for a little loved one. I hope you liked today's card and are inspired to create something of your own. If you haven't already, please follow me on the right side bar or over on Facebook, so you don't miss any future posts. Drop me a line in the comments section below and let me know what you think. Happy Heart Day Series | Beary Lovable ft. Gerda Steiner "Warm Fuzzies"
Today's card fits in two different series', but in the interest of not having a title as long as the blog itself, I'll keep it to my Happy Heart Day Series today; though, as you can see it would also fit in the Coloured on Kraft Series. Anyone who watches card making videos on YouTube has had to have seen stamps by Gerda Steiner Designs. This is the first time that I am trying them out and I have to say that I'm very much impressed. They have a bunch of sets and I'm very excited to get my hands on more of them. To begin, I stamped this bear from Gerda Steiner's "Warm Fuzzies" with VersaMark ink on 65lb Kraft paper by Recollections, then coloured him with Prismacolor Premier pencils. I used an inside out stitched rectangle to cut him from the centre of the paper. I then used an open heart stamp randomly about the outer frame and then coloured them with pencils as well. I adhered the frame to the front of a standard A2 sized card base and added the little bear piece back inside. To cover the cut edge, but preserve the stitching, I laid down a line of liquid adhesive and sprinkled red glitter over it. With all the stamps and embellishments and patterned paper and glitter (the list goes on and on) we have these days, every now and then I like to go back to my roots. To where I started out with just some cardstock and some paper flowers. For this card, I wanted a high contrast with a very simple design. I felt the black with white accents would convey my intentions in a delicate and elegant way. This card pretty much speaks for itself; though if I were to change anything, I would have made the card base out of black cardstock. As the outer frame is raised, you can see the white base around the inner area. If you look at the card straight on, you can't really see it, but at any other angle it's there. Happy Heart Day Series | Kisses Magic Slider ft. Lawn Fawn "Sealed with a Kiss"
For every series, I try to do at least one (or maybe two) interactive cards. I love this type of card because they're so fun! Getting a card is nice, getting a handmade card is better, getting an interactive handmade card is the best. They take a bit more time, but the results are absolutely worth it. As a card maker you feel more accomplished and as the recipient, you know how much effort was put in. To create this card, I cut down a piece of patterned heart paper and adhered it to the front of a standard A2 sized card base. I then cut down a piece of vellum to the same size and put that over top. This step isn't really necessary, but the paper was pretty busy so I wanted to mute that down a bit. I cut out all the pieces I needed using Lawn Fawn's "Magic Color Slider" die set and began stamping my images. For stamping on the acetate, I used StazOn Black ink. StazOn is a solvent ink that will dry on smooth surfaces. If you are using a different kind of ink and finding that it smudges, give this ink a try. I stamped the remaining images from Lawn Fawn's "Sealed with a Kiss" set using Memento Tuxedo Black ink on 110lb Copic-friendly cardstock. I coloured all the images ink with Copic markers then masked them off, so I could sponge the background. I started with Spun Sugar Distress Ink, but found that was too light, so I added Worn Lipstick to the edges and pulled that in until I got a blend I liked. The outline of the seal on the right and the word "Sealed" are darker because of the extra layer of ink. Once the slider was done, I adhered that to the front of my panel. If you are having trouble making your slider card slide, I recommend cutting a second channel piece from the dies (that's the one that looks like a U, I have found that doubling the channel pieces allows for a much smoother slide. Happy Birthday | Mission Control ft. MFT "Space Explorer"
When I was able to get my hands on this set from MFT I was over the moon (pun intended). I mentioned before (several times) that I find it difficult to make cards for men, but just as difficult are cards for the boys. This set is fantastic for either gender, but it is really nice to have a set that can be easily used for guys. To begin, I stamped this little spaceman and the planet from MFT's "Space Explorer" set with Memento Tuxedo Black ink on a piece of 110lb Copic-friendly cardstock. I coloured all the images with Copic markers and fussy cut them out. I would normally have used my Brother 2 Scan N Cut, but my craft room is kind of a mess right now and I was in a hurry. Next I created the galaxy background by sponging on Wilted Violet, Mermaid Lagoon and Twisted Citron Distress Ink, I then used Chipped Sapphire to fill in the spaces between the coloured areas and finally Black Soot over the top, ensuring that it was darkest around the edges. I used my Distress Sprayer to splatter clean water and patted that dry with a paper towel. Once the panel was mostly dry I splattered Copic Opaque White to create all the stars. When the panel was completely dry, I prepped the lower left corner with my powder tool and stamped the greeting from the same set with VersaMark ink and heat embossed with detail white embossing powder. I adhered my galaxy panel to the front of a standard A2 sized card base, then added the planet. For the spaceman, I used a small action wobbler to tack him down. So when you touch him he wiggles back and forth. Once I sort out videos, I'll be sure to include (at least) one with an action wobbler. They add such a great interactive element to a card! Pattern Stamping | ft. Lawn Fawn "Blissful Botanicals"
Hi everyone, thank you for stopping by. I hope you are have a great day. Ever wish you had more than one of the same stamp set so you can use them at the same time? It was never really a problem for me until I got the MISTI (or any other stamping tool you may be using) it opened up a whole new world of stamping multiple images at the same time. I wanted to create a pattern that radiated out from a central point, but I wanted it to be exactly the same all the way around. Sadly, I don't have more than one set of stamps (or the money to buy multiple sets); so what to do? To create this card, I started by cutting down a piece of heavyweight cardstock to 6x6 and drew very light lines from corner to corner, creating an X. I placed the paper in my MISTI and prepped it with my powder tool. I then arranged my stamps from Lawn Fawn's "Blissful Botanicals" in an array along one of those lines, filling a corner or 90 degrees of the paper. I then used VersaMark Ink to stamp the images, turned the paper 90 degrees and stamped again, until the whole sheet was covered. I heat embossed with silver detail embossing powder. I coloured all the images with Copic markers, making sure that each image was coloured the same for each section of the paper. Once that was completed, I trimmed the panel down and adhered it to the front of a black standard A2 sized card base. I used the scripty "Thanks" die from Lawn Fawn to cut a piece from white paper and another from black cardstock and adhered them, offset, to the front of the panel. Happy Heart Day Series | ft. Lawn Fawn "Wheelie Like You"
I got this set almost as soon as it was release, I had so many plans for this little guy, then it arrived and nothing. This is actually the first time I have ever even inked it up. Sad, right? But it happens. I also noticed that all my critters are little "guys". Not sure why, just a funny little thing I have. Anyway, you may have noticed that my posts are a bit more sporadic than usual. Well, I have a new job! For the first time since my youngest was born (five and a half years ago) I'm working. Once the training is over, it's every other weekend some stat days and then every now and then if someone else's shift needs to be covered, but I'm working! I knew I missed work, but honestly I had no idea how MUCH I missed it until I started last week. To begin, I stamped the little hamster from Lawn Fawn's "Wheelie Like You" set with Memento Tuxedo Black ink on 110lb Copic-friendly cardstock. I then masked him off and stamped the wheel with the same ink. I removed the mask and coloured the images in with Copic markers. I used one of my scalloped circle dies to cut out my little panel, then stamped the greeting on the top edge using the MISTI. For the background, I adhered a piece of heart cardstock to the front of my standard A2 sized card base, then added a strip of red glitter paper across it. I popped up the scalloped circle panel with some foam tape and mounted that on top.